Home » Blog » A Book Fair! In my famous “Trendsetter and Hipster’s Guide to Enjoying Lisbon” blog post, one of the pieces of advice I offered was to look in metro stations for entertainment opportunities. This advice has served me well. In addition to the upgraded touch-screen kiosks listing events in the upcoming weeks, there are the traditional billboards and the free Metro newspaper. In one of last week’s newspapers, I found an article with the schedule of the 86th Lisbon Book Fair (or in Portuguese, Feira do Livro). The article promised that this year’s festival would be bigger and better than ever, with hundreds of booths and publishers from outside as well as within Portugal. 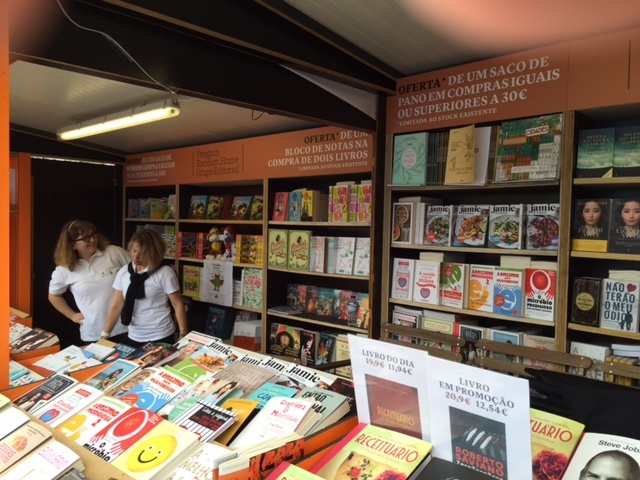 A Translation Van featured classic Portuguese authors in French, German, and English. With my rudimentary math skills, I’ve figured out that the fair started in 1930, give or take a few years for cancellations. In 1930, Fernando Pessoa ruled Portuguese letters as a poet, novelist, journalist, translator, and critic. I’m sure he and his closest colleagues had a major role in this event. At the same time, the country lived under a military dictatorship, and writers worked within the constraints of increasingly tighter censorship, culminating in the 1933 decree of the Estado Novo that banned all “immoral” and “subversive” expression. The literary writers of the time avoided politics for the most part — many of them, Pessoa included, were conservatives or monarchists, as appalled by the rise of communism as the country’s leaders. The book-buying public was a small one, restricted to the country’s educated urban elite. More than 60% of Portuguese did not know how to read or write. 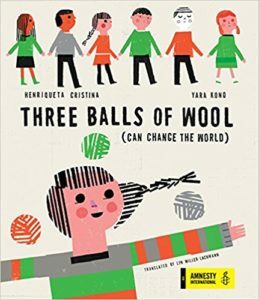 Today, Portugal’s children attend school and the literacy rate is about 95% (lower for women than for men, in large part as a vestige of the dictatorship that ended in 1974). It makes sense, therefore, that the book fair has grown exponentially in size, duration, and number of public activities since 1930. 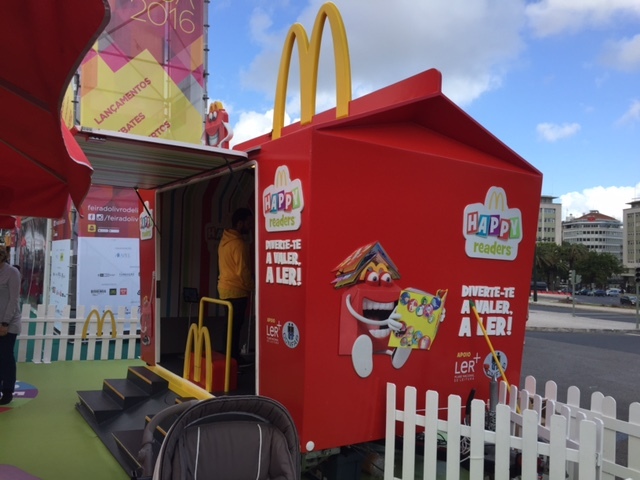 The country’s encouragement of early literacy was very much on display, for instance with a McDonald’s-sponsored reading game and giveaways of books. 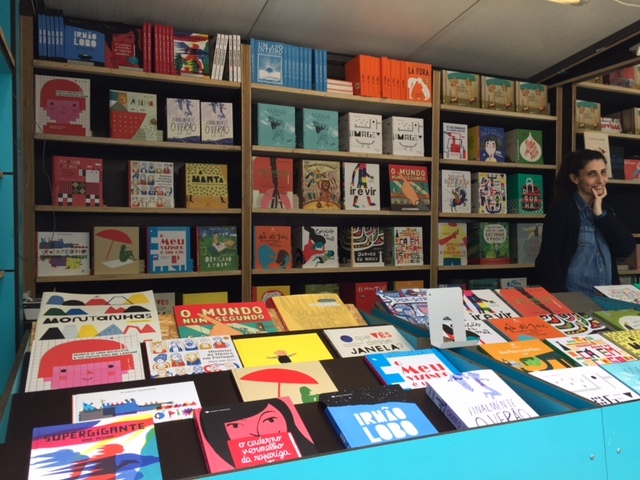 The bigger Portuguese publishers arranged multiple booths around a common area, allowing children’s activities, panels, and signings. When I first arrived at the fair on Saturday morning, I practically had the entire Parque Eduardo VII to myself. Despite broken clouds, the weather forecast called for rain, and everyone knows that rain and books don’t mix. About half an hour after I arrived, while I was chatting with a young man selling Portuguese classics translated into French, German, and English, the predicted cloudburst occurred, and I ended up helping him set up an umbrella and wiping raindrops from the bookshelves. Then a gust of wind carried the umbrella away! Oops! We managed to save the books, and after the sun once again emerged, I went on my way. 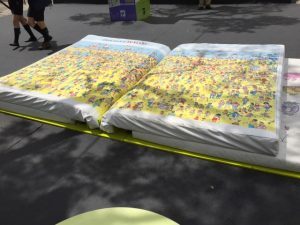 The booths were divided between large publishers like LeYa and Porto Editora , with their multiple imprints clustered around a stage for presentations and signings and a tent where customers could pay for all their books — general adult titles, children’s books, graphic novels, and specialized books in various fields — in one place. Many of the country’s key journalists, critics, novelists, and political figures gave talks and panels, including the newly-elected Prime Minister on opening day. Other authors signed books inside the booths for individual imprints. 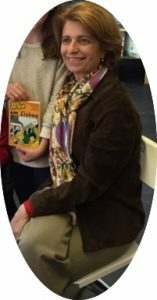 Isabel Alçada, with one of the “Uma Aventura em…” books I read years ago. For instance, at the booth for the Caminho imprint of LeYa I met Ana Maria Magalhães and Isabel Alçada, co-authors of the “Uma Aventura em…” series for middle grade readers that now contains somewhere north of 100 volumes. 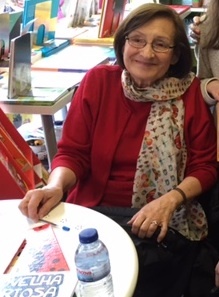 This was the series I read years ago when I first started to learn Portuguese, so I have a soft spot for these women who have contributed so much to Portugal’s literacy efforts as both prolific authors and, in Alçada’s case, as a former Minister of Education (a job she apparently liked a lot less than writing). The Penguin Random House booth, where I introduced myself as one of the “family” and bought a book. Planeta Tangerina appeared via the distributor, who had the publisher’s earliest books and the most recent. 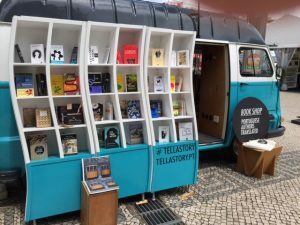 In addition to the large commercial Portuguese publishers, the quirky and artistic small presses, and the smaller outposts of multinational publishers, the fair offered an array of academic, specialized professional, and religious publishers. 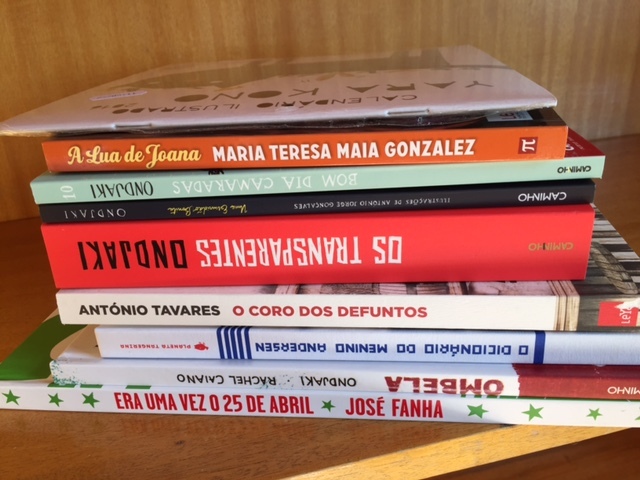 The Catholic publishers had a significant presence despite the precipitous decline in church membership and religious observance in Portugal since the end of the dictatorship. Perhaps the Church’s new direction under Pope Francis will help to revive interest in and broaden the offerings of the these publishers. Only some of the books I bought on this trip. How will I get them home? As I waddled back to the university residence, I wondered how I’ll get all those books home without having to pay a weight penalty at the airline counter. I’m sure I’ll figure something out, but in the meantime, I’m thrilled with my new purchases, which I’m looking forward to reading and translating. 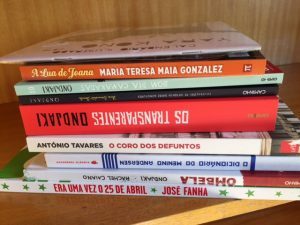 Despite its small size, Portugal has a thriving literary culture, one that has come to incorporate important authors from Lusophone Africa such as the Mozambican writer Mia Couto and Ondjaki from Angola. There are graphic novels that explore the colonial wars and their aftermath, and books that reconsider the country’s history and look forward to its future. Lucky you! I particularly love the translation van! What a fabulous insight into the fair. I almost feel like I’ve been there. Maybe next year we can meet there! Looking forward to seeing you in Porto soon! Good thing you were there to help save those books! Sounds like a great time. A 95% literacy rate is great! It was a great time, and the 95% literacy rate is especially impressive given the lack of access to education for much of the population before the 1974 revolution. Basically, they had to educate children whose parents had little or no formal education and were thus not able to help their children with homework. Adult education played a major role in helping Portugal catch up to the rest of Europe from the late 1970s on.